Chris was born and brought up in a poor township community in Cape Town during the apartheid years. As a child of mixed color during this time, he had to face a lot of challenges, but this never rattled Chris' passion for his people and his country. 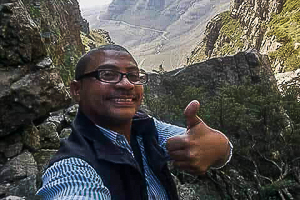 This passion eventually drove him to study Traveling and Tourism, focusing extensively on the culture, wine, history, and environmental offerings of Cape Town and the Western Cape Province. Chris joined the industry in 2002 and has been sharing his love of Cape Town ever since! Chris believes that, through tourism, he can make a difference in the lives of his people and his country. Tourism not only helps create jobs, but also helps decrease poverty and put food on the table of many local South Africans. This is why Chris is such an amazing guide! His love and passion for this industry is rooted in something deep and meaningful, and he can't wait to share that with everyone!